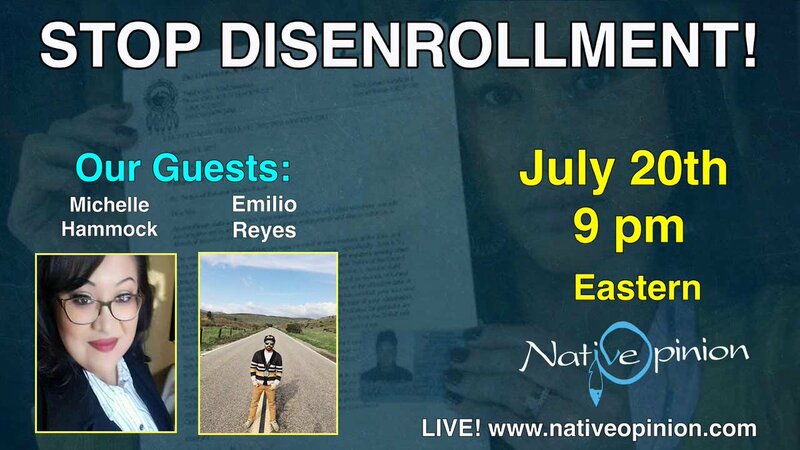 I know it's late notice, but please make every attempt to listen in tonight to Michelle Hammock and Emilio Reyes as they discuss disenrollment in Native America. Listen to "Episode 134 "And Thier Beat Goes On"" on Spreaker. 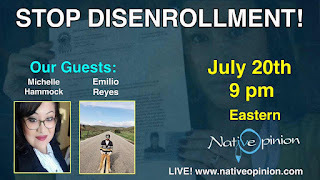 Nobody is disputing a tribes sovereign right to determine its own membership which means a tribe can set the criteria for enrollment and then every member must qualify based on the enrollment criteria. In Pala that’s not what’s happening and the BIA should be able to step in and not trample on Pala’s right to determine its own membership. You see Soboba, Cahuilla, Morongo, and Pala all enroll Margarita Brittain descendants but only Pala enrolls with MB listed as 1/2 Cupeno and the other 3 tribes enroll with her as 4/4 Cupeno the way it has always been. So even tho a tribe can determine the qualifications for enrollment who determines natives blood degree?? Isn’t the BIA suppose to be the record keepers of all natives and have a central data base where each original allotee and every native has their blood degree on file? This should be the final say on natives blood degree and then each tribe can enroll members using whatever qualifications they like but all have to use the same data base for Native Americans blood degree. Pala has enrollment qualifications which are a direct descendant of an original allotee in the 1895 or 1913 rolls and at least 1/16 Cupeno. In order to make the disenrolled not meet these qualifications they lowered Margaritas blood degree and never gave the tribe or BIA a reason why??? So the BIA is not interfering with Pala’s enrollment by demanding they list MB as FULLBLOOD like the BIA,Dept of Interior records state. They are not telling Pala to change their enrollment criteria just that they have to be correct and accurate when using natives blood degree and lineage. A birth certificate and census is not something you can just change it is fact and every tribe should have to use the correct data. Imagine your state Governor made a law that only Mexicans can live in California. That is California setting the rules for who can live in their state (like a tribes membership). Your mom is Mexican and your dad is white so you could live in California but then the Governor says no your not Mexican your only white you need to leave the state. Even tho you have documents and census records stating your race over the years the Governor doesn’t have to accept it or even look at it. Or he does look at it and says this is incorrect you are only white not Mexican so you need to leave California. Same thing that is happening in Pala. If the Federal government said its California’s choice to decide who can live there and they can’t interfere. The Federal government isn’t really interfering in California’s law by looking at your records and telling California you are half Mexican and it is a fact so they need to list you as such. Now then if California has to except the truth that you are Mexican and can stay in the state then it is also their right to change the law so that only Irish can live in the state and the Fed’s can’t intervene that is California’s right. As long as they use the correct census for every person and not change them to suite their needs like in Pala.